Anyone seen previews for the new Star Wars animated movie? LOS ANGELES - George Lucas is revisiting familiar space in the heart of Hollywood to unveil his new "Star Wars" adventure. The animated tale "Star Wars: The Clone Wars" will have its world premiere at the Egyptian Theatre along Hollywood Boulevard on Aug. 10, five days before it opens in theaters. Lucasfilm announced the premiere Wednesday. Proceeds from the premiere will benefit the American Cinematheque, a film organization based at the Egyptian, which opened in 1922. The Egyptian was one of two Los Angeles theaters where the first "Star Wars" sequel, "The Empire Strikes Back," played during its extended run in 1980. Tickets for the 4 p.m. premiere will be on sale exclusively to American Cinematheque until July 23 and will then be available to the general public. "Few cinemas have had the opportunity to host a premiere of a 'Star Wars' movie, and we are tremendously excited that the historic Egyptian will soon be one of them," said Barbara Smith, director of the American Cinematheque. "The Clone Wars" will be followed by an animated TV series of the same name debuting this fall on the Cartoon Network and TNT. The movie and TV show are set between the action of the second and third chapters of Lucas' prequel trilogy, "Attack of the Clones" and "Revenge of the Sith." The film centers on a galactic civil war, with Jedi knight Anakin Skywalker — the future villain Darth Vader — embarking on a mission that pits him and his apprentice against crime boss Jabba the Hutt. The voice cast includes some veteran "Star Wars" performers, including Samuel L. Jackson as Mace Windu, Christopher Lee as Count Dooku and Anthony Daniels as C-3PO. Among other key voice cast members are Matt Lander as Anakin, Ashley Eckstein as his apprentice Ahsoka Tano and James Arnold Taylor as Obi-Wan Kenobi. 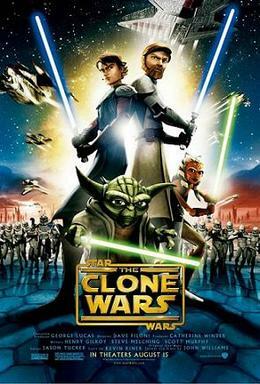 Lucas served as executive producer on "The Clone Wars" movie, which was directed by Dave Filoni. Ah... I thought this was to be a tv series? Whatever, either way it looks pretty interesting. The animation seems VERY fluent, and those battle scenes looked incredible. I'd definitely like to see this. But I'll definitely watch it for the animation. Honestly, it just looked that good (imo). Yes, there was already a TV series, but isn't this going to lead into a new one concerning the clone wars or something? There was a thread on this already, but doesn't matter. This movie is going to be great. Love Star Wars and the animation looks amazing. Can't wait till August 15th! And of course after I watch this, I'll wait till Sept for Force Unleashed! I liked the clone wars episodes that aired on tv, so I guess I'll watch the movie. I usually like Star Wars movies but I don't know if I'll see something like this. Probably. I do like Star Wars. Even if it's the Clone wars. I loved the star wars series that was on T.V. I don't think I will watch this movie. This is probably the single most unnecessary movie ever. Am I the only one that thinks this movie will ****-off money movie? I find myself agreeing with this sentiment to a large degree. You ain't got no YEEZY!?! QFT, even though I'm going to be in line for this one, being the huge Star Wars fan that I am. Tho with me being a Die-hard Fan of Star Wars. I really can't say that I didn't want another movie of some sort. TV series was enough tho. Didn't really need a movie along with it. I might check it out. Don't know really. somewhere falling down stairs what else? In this location box. Let me out plz! Yah my class went to see speed racer. It was s preview. SInce I love starwars I will have to see it but I dont think it looks htat good. Well It looks weird. if its starwars it has to be good. Kinda how like the old Clone Wars series was thought to be epic failure, amirite? Everyone thought the first Clone Wars series would be an epic failure, but it praised and won an Emmy.